What it’s about: If you only know one thing about baseball, it’s that there’s no single moment in the game more exciting than a home run. The crack of the bat, the ball sailing over the wall, a lucky fan going home with a souvenir, and a heroic slugger casually trotting home. But this wasn’t always so. In the first two decades of the 20th century, baseball was a quieter, more strategic game, and home runs were about as common as meaningful Padres games in September. This all changed in 1919, when Babe Ruth hit 29 dingers, topping the previous season’s high of 11, and power hitting has been part of the game ever since. But today we pause to remember a simpler time, when mustaches were curlier, players had names like “Old Hoss,” and the ball didn’t travel so darn far. Strangest fact: Just because players didn’t hit it out of the park doesn’t mean they couldn’t hit for power. In 1912, when Heinie Zimmerman led the league with 14 homers, Pittsburgh’s Chief Wilson hit 36 triples, a record that stands more than a century later. Given that a triple involves running past three bases before the fielding team can make a throw to the infield, it’s a more impressive feat than a home run in a lot of ways, and considering only three players have hit more than 21 in the 103 years since (Sam Crawford hit 26 in 1914; Kiki Cuyler did the same in 1925; and Curtis Granderson hit 23 in 2007), Wilson’s record is thought to be unbreakable. Biggest controversy: Besides the obvious one, that some of the best hitters in the country wouldn’t be allowed to play in the majors until baseball began to integrate in 1947? The reasons for the dead-ball era and it’s ending are murky at best. Some claim major league baseball quietly replaced the regulation ball with one that had more bounce, but the factor might be that they replaced the ball at all. In the days before baseball was a lucrative institution, penny-pinching teams would use the same ball until it started to come apart at the seams. A well-worn ball got soft, and harder to hit a long distance. A 1921 rule said the ball had to be replaced any time it got dirty, so any hitter’s bat was more likely to connect with a pristine ball that had more bounce. 1921 also saw baseball outlaw the spitball—pitchers found that a spit-covered ball would have less of a straight trajectory, making it harder to hit. The practice was rampant, and gave pitchers a big advantage until it was outlawed. Thing we were unhappiest to learn: Baseball’s changes to how the ball was handled largely came about because of the death of a player. Ray Chapman was a shortstop for the Cleveland Indians who was hit in the head by a pitch, collapsed, bleeding from his left ear, and died from the injury 12 hours later (the only player in major league history to die from injuries sustained during a game). The consensus was that he never saw the ball coming. As related in Ken Burns’ Baseball, “Part of every pitcher’s job was to dirty up a new ball the moment it was thrown onto the field… They smeared it with dirt, licorice, and tobacco juice; it was deliberately scuffed, sandpapered, scarred… and as it came over the plate, [the ball] was very hard to see.” Baseball was still decades away from electric lights, so late innings were often played in twilight, and a speeding ball that was no longer gleaming white was hard for the hitter to see. The baseball world was so shaken by Chapman’s death that the rules were changed almost immediately. The incident also popularized batting helmets, although they wouldn’t be required by the rules for another 30 years. Also noteworthy: While 1900 is considered the start dead-ball era (in large part because hitting overall was down from the previous century, not just home runs), home runs were even more scarce in the game’s first decade. The now-defunct National Association is considered the first “major league,” and started in 1871, joined by the still-existing National League five years later. No one in either league had a double-digit home run total until Harry Stovey hit 14 in 1883, smashing the previous record of 9. (By comparison, Frank Howard hit 10 home runs in a week for the Washington Senators in 1968.) In 1877, Lip Pike led the National League with just 4 homers, and Paul Hines did the same the following year. There’s no question about the dead-ball era ending for good in the ’20s, however. After Babe Ruth set a longstanding record of 60, the only player to lead the league with less than 30 was Tommy Holmes’ 28 in 1945, when rosters were depleted by WWII. Best link to elsewhere on Wikipedia: If you’re not interested in baseball, you’re out of luck, as every link leads to a player, team, or baseball term. And while it’s fun to look up old-time players with names like “Cactus” Carlton “Gavvy” Cravath, the best-known player here apart from Ruth, and perhaps the one with the most affecting story, is “Shoeless Joe” Jackson. Dramatized in Eight Men Out, Field Of Dreams, and reportedly the inspiration for The Natural, Jackson was poor and illiterate (his wife had to sign his autographs). He started playing amateur baseball at age 13. He started as a pitcher, until he threw the ball so hard he broke a hitter’s arm. At 21, he married 15-year-old Katie Wynn, and got called up to the big leagues, immediately becoming a star player—he batted .408 as a rookie, still a record, and to this day, he has the best career batting average ever recorded for both the Cleveland Indians and the Chicago White Sox. But it was with the White Sox that Jackson became infamous, as he was one of the players named in the Black Sox Scandal, in which several players were bribed to lose the World Series. Jackson proclaimed his innocence (and that the famous courthouse exchange with a child pleading, “Say it ain’t so, Joe!” never happened) and was acquitted in court, but still banned from baseball for life and is still prohibited from being voted into the Hall Of Fame. Further down the wormhole: While baseball became an organized, professional sport in 1871, its actual origins are a bit murkier. 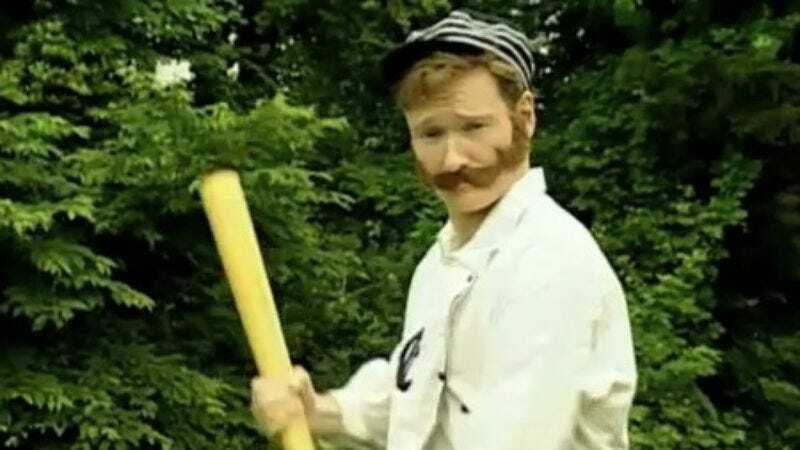 The game apparently evolved from the English sport of rounders, but the official story—that the game was invented in 1839 by Abner Doubleday—is believed by no one, apart from Major League Baseball, who still consider that myth the official story. The true origin story seems to be that Alexander Cartwright organized the first baseball game in 1846, in Hoboken, New Jersey (and he was recognized by Congress for inventing the sport in 1953). Cartwright led the Knickerbocker Base Ball Club, a group of firefighters who played a playground game known as town ball in their off hours. But in drawing up a fixed set of rules, Cartwright made the game more complicated, and into something new. He was the first to arrange the bases in a diamond, at fixed distances, and also decided that three strikes meant you’re out. He didn’t stick around Hoboken for long, however. In 1849, Cartwright followed thousands of Americans in the California gold rush, later settling in Hawaii, where he set up a baseball field on Oahu. We’ll look at that and other gold rushes around the world next week.